Virginia & Truckee Railway Mail, Express & Baggage Car Second No. 21 is pictured amidst the V&T's main Carson City Yards in May of 1949. Photographed in its forty‑second year of service, the sleek RPO initially saw duty on the close by Nevada Northern Railway where it operated for over 30 years. Fabricated in 1907 by the American Car & Foundry Company of St. Charles, Missouri, the standard gauge mail carrier was purchased by the Nevada Northern Railway to be their No. 21. (It was a near twin of Nevada Northern No. 20 which had previously been acquired second hand from Harlan & Hollingsworth, and is still on the Nevada Northern in Ely. 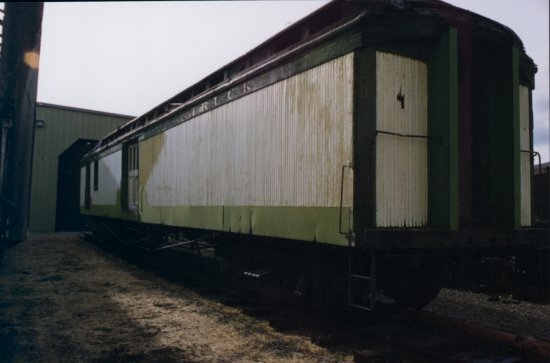 It was converted to a mail and baggage car, and in 1912, the steel under frame was applied). Of wood body with a steel under frame, the car measured 64 feet long and 10 feet wide overall. A total of 42 feet 6 inches was devoted to a baggage compartment inside leaving 16 feet 9 inches for a small mail compartment; both sections measured 9 feet 1 inch in both width and height inside. With two four wheel trucks equipped with Westinghouse airbrakes, No. 21 rolled smoothly on 33 inch solid wrought steel wheels and 5 by 9 inch journals. The Nevada Northern Railway was formulated in 1905 to connect prosperous new copper mines west of Ely, Nevada, with distant northern smelting operations as well as transcontinental rail service. Beginning at the new station of Cobra, Nevada, on the Southern Pacific railroad, the Nevada Northern extended 140.5 miles southwest to Ely in White Pine County and an additional 10 miles west to copper deposits near the community of Veteran. Painted a distinctive dark red, Railway Post Office Car No. 21 was in frequent use on the road along with slightly larger yet similar RPO No. 20. Having been painted red on the Nevada Northern for the last time in March 1939, No. 21 was sold to become V&T Second No. 21 on July 14, 1941, f.o.b. Cobra for $1,100 and was intended to replace aging V&T Mail & Baggage No. 13 which was turned out in 1874. Because of its comparatively light weight of 87,600 lbs. and large 73 by 591/2 inch baggage and 71 by 281/2 inch mail doors, the car was well suited to V&T service and was quickly pressed into six day a week use. 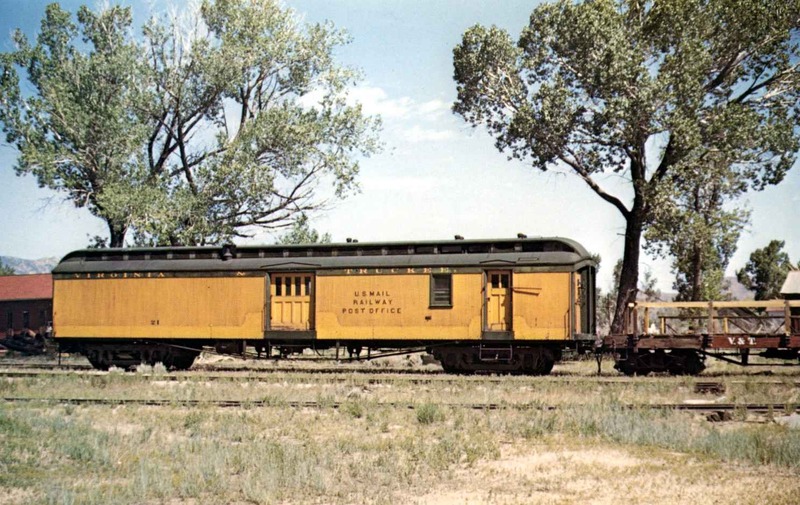 Presented to the State of Nevada late in 1950 upon the closing of the famous railroad, the Mail‑Express‑Baggage was proudly displayed north of Carson City along with engine No. 27 and coach 18 for six years until gutted by fire on August 29, 1961 . Entering the care of the Nevada State Heritage Association in 1963, Virginia & Truckee Second No. 21 has since been stored at the Carson City Airport beginning in 1963, at Mound House, Nevada effective in February 1971, and finally in the fall of 1972 to southern Carson City where limited restoration is once again anticipated. One of the Virginia & Truckee Railway's longest pieces of passenger related equipment, Second No. 21 is pictured with secondhand 34 foot V&T flat car No. 59. Specially outfitted, the two cars are photographed in repose just prior to their use in the gala May 29, 1949, excursion consist of the California Nevada Railroad Historical Society train which served to herald the close of the illustrious V&T. V&T 2nd No. 21 was a large car for the railroad, but served faithfully to the end of the V&T. It was included in the last train run on May 31, 1950. Saved as a memorial to the V&T, baggage-mail-express car No. 21 was displayed after 1955 at the north end of Carson City, along with locomotive No. 27 and coach No. 18. In 1961, some kids set a fire inside coach No. 18, burning it and damaging the end of car No. 21. Today, the car is largely intact, although the mail equipment has been removed. It might be appropriately displayed at the Nevada State museum facilities in either Carson City or Ely. As today at the Nevada State Railroad Museum awaiting restoration.